Cities as laboratories (see this for a good overview) have been the talk of the town for a while now — but what do we really mean by it and more importantly, what are the underlying structures that allow such fluid and experimental forms emerge? Last week I took part in a ‘Lab of Labs’: a series of hands-on design charrettes that explored a variety of approaches for living labs and design research practices and methodologies. The different labs explored the role empathy can play in designing inclusive interactions in the city, how roots and identities are expressed in the context of global cities, methods for designing for sociality in smart cities as well as the emerging role blockchain can play in reimagining the economic systems that underpin everything that surrounds us (the latter was run by the The Centre of Design Informatics at the University of Edinburgh and attended by yours truly). And this is where it gets interesting. In the past decade I took part in countless workshops, design conferences, charrettes and competitions about various aspects concerning ‘cities’ — almost always conceptualised as an abstract measurement unit, rather that a living, continuously forming collision of human and non human systems. This was the first time where a deliberate question around the values we exchange (or want to exchange) was shaped through unpacking the economic systems that underpin all our monetary and non-monetary transactions. The methodology was straightforward, yet insightful: exploring blockchain through physical mimicking (with Lego! ), playing with tech probes (imagine us running around Amsterdam staring at our phones in order to collect mili-Bitcoin rewards and then trying to guess what the rules of the transactions were), moving onto ideation and prototyping. 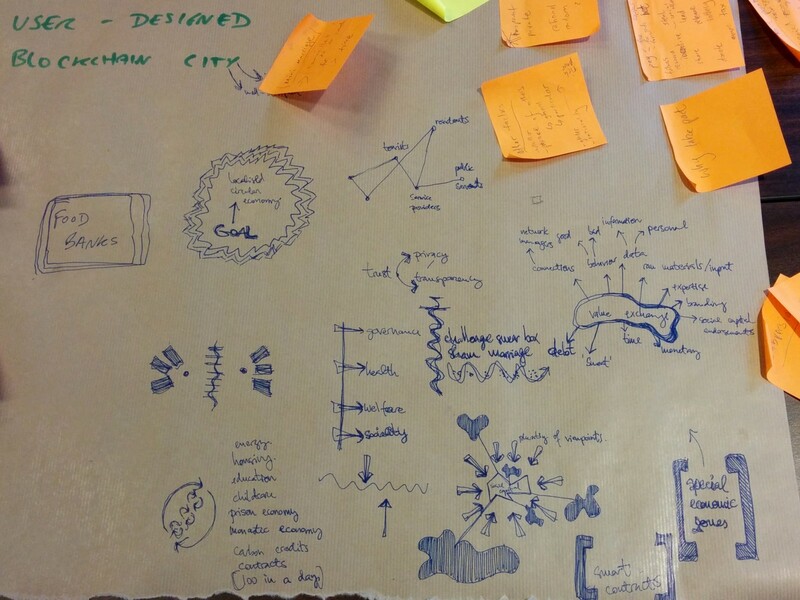 Brainstorming: what are the values exchanged in the city / what other economies exist in a city? What are the values underpinning the current economic system and what types of value are exchange (subtle, yet significant distinction)? Who are the actors? What’s the power dynamic? What values do we want to form the basis of an emerging economic system and how can we be deliberate about the change we want to see? What are the inherent qualities about blockchain and how can they be explored to the maximum to engender a transition towards a sustainable future? How can blockchain be used beyond an incentive / reward / fining model (for some background on DAOs — decentralised autonomous organisations see @maciejolpinski blog here)? What’s the untapped potential of geolocating transactions that otherwise happen online? Could this bring a different meaning to ‘special economic zones’? In the context of signs of anarcho-capitalism forming in front of our eyes (see this recent piece from The Guardian: ‘Tech titans are busy privatising our data’), how can this third wave of self-organising / commons / citizen innovation (as we call it at Forum) help us question the status quo and act deliberately to unlock the paradigm shift we need?